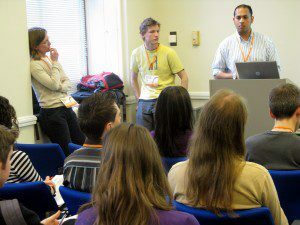 Last week I had the pleasure of facilitating four workshops at MoodleMoot 2010 held at University of London Senate House which was very convenient for me as all I had to do was go upstairs to attend. The event had a real energy throughout the two days, which was kick started by a visionary speech from the incoming Vice Chancellor of University of London, Professor Geoffrey Crossick. He impressed me with his knowledge of IT and its potential to enhance learning, which I hadn’t expected from a university Vice Chancellor. Next was the charismatic and very thought-provoking Professor Sugata Mitra. I have heard Professor Mitra speak several times before and he has always stolen the show. Everyone was talking about his presentation throughout the conference. His brilliant presentation was based on his work in exploring how to use technology to educate children who do not have access to English speaking teachers or computers. He showed the power of the social constructivist model where, in his experiments, children are able to learn through social interaction with a computer without the active in-put of a teacher. The role he takes with children is more that of a facilitator. He sets children puzzles in an informal setting and gets incredible results. I facilitated four workshops over the two days and was very impressed with the creativity and innovative ways people had found of using learning technologies like Moodle and Mahara. We had presentations on Moodle in the Health sector, Moving to Moodle from other systems, Linking Moodle to other internal systems, and using the Mahara e-Portfolio system in colleges. Each workshop had several presenters from different organisations which gave delegates a rounded view of the topics and a range of approaches which could be followed. The workshops included question and answer sessions and discussion which proved to be very popular. Highlights for me were the presentation from Fehmi Hanoglu of Hackney Community College on their linking Moodle to their internal MIS and monitoring systems. This has led to a rich ILP (Individual Learning Plan) which enables staff and students to easily set goals and track progress on a student by student basis. The ILP enables learners to develop responsibility for their own learning and share this with their tutors. This has enhanced communication between learners and staff which has resulted in improving standards across the college. The other presentation that really caught my eye was Angela Jay from Lewisham College. Angela explained how the Mahara e-Portfolio system had been a success at Lewisham without the college having to promote it. It is so popular with learners that it sells itself. Angela demonstrated a traditional CV against a CV a catering student had created in Mahara and there was no comparison between the two – Mahara won hands down. Portfolios such as this will vastly improve the chances of students gaining employment. There was also an interesting discussion about the possible use of Mahara e-Portfolio systems being used as an Alumni system. It could be a great way for colleges to keep in touch with their former students and celebrate their future successes with them. Acting as a facilitator at MoodleMoot 2010 was a very easy job as sharing expertise, information and ideas with so many creative and dedicated educationalists was so interesting and inspiring that the two days flew by before I knew it. I am already looking forward to MoodleMoot 2011. Copyright Moodlemootuk2010. All rights reserved.